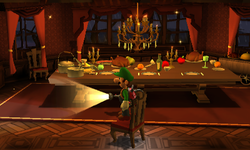 The Dining Room is in the Gloomy Manor in Luigi's Mansion: Dark Moon. This area is accessed by taking the door on the right on the second floor of the Library. The Dining Room has a large table with food on it. There are carts of food found around the table as well as a cabinet with silverware and plates. Peering into the window inside this room will give the player a glimpse of the outside of the mansion, though nothing happens and nothing can be seen by doing so. Taking the door on the south wall of the Dining Room takes the player to the Balcony. Pulling the red cord north of the door reveals a dumbwaiter that takes the player to the Kitchen. During Quiet Please!, Luigi needs to go to the Dining Room to use the dumbwaiter to go into the Kitchen. In Visual Tricks, a Boo causes several pieces of furniture to vanish by using Spirit Balls. This mission's Boo is also in the Dining Room and can be found by shining the Dark-Light on the missing table. In Sticky Situation, the Dining Room may be one of the rooms that is covered in spider webs. Starting in Quiet Please! and all missions after, the player can shine the Strobulb on a safe in the ceiling to reveal an amethyst. This page was last edited on November 9, 2017, at 22:56.